My son is one of the contributing editors, among other things, for Patriots Life, Celtics Life, RedSox Life and more. He was looking for some tongue and cheek recipes for patriot’s life, how I could resist. Gronkowski was drafted by the New England Patriots in the second round (42nd overall) of the 2010 NFL Draft. He set an NFL record for receiving yards by a tight end in a single season with 1,327. Hey you got to feed the team and the coaches right! Ingredients – like Gronk something a little different. 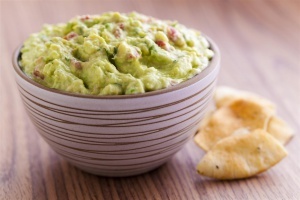 In a large bowl, coarsely mash avocados, leaving some chunks. Serving Suggestions: Serve with chips. Beverage Pairings: Beer what else? This entry was posted in Dessert, Appetizer and Snacks, Patriots Game Day, Vegetables and or Vegetarian and tagged Avocado, California Avocado Commission, New England Patriots, NFL, NFL Draft. Bookmark the permalink. Made the GRONKACAMOLE! So yummy and lots of compliments. I did add some cayenne pepper, cuz spicey is good! That was a great addition and you are right Spicey is good!